My Talking Book machine with an audio cartridge and mailing case. I’ve been a voracious reader all my life. When I became a writer in my 30s, I depended on my eyesight for reading, plus research, writing and editing. In 1996, I lost the use of my right eye from wet macular degeneration, but I was still able to read using my “good” left eye and low vision aids. Then on the morning of August 13, 2001, all that changed. I woke up and couldn’t see out of either eye. That afternoon in my retinal specialist’s office, I learned I had hemorraghed in my good left eye. It was then I heard the worst news of my life: “My friend, you are now legally blind,” said my doctor. My life, and Sandra’s, had changed dramatically. Many years later, someone told me about the National Library Service (NLS) at the Library of Congress… a free braille and talking book library service for people with low vision, blindness, or a physical disability that prevents them from reading or holding the printed page. 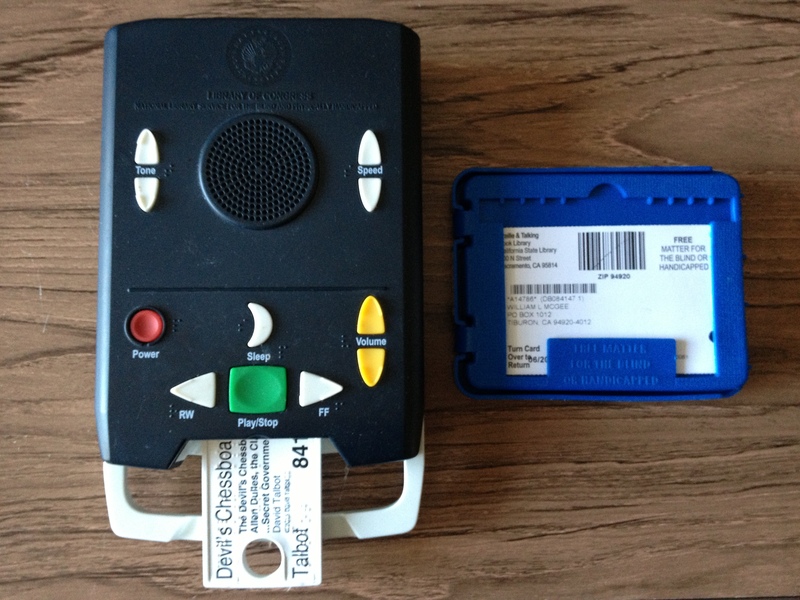 I applied, was accepted, and the NLS sent me a special Talking Book machine to use to listen to audio books on specially-formatted cartridges (see photo above). The NLS sends me a quarterly catalog; I select the books I’m interested in (Sandra reads the catalogs to me), and the NLS delivers the cartridges to me in the mail, postage-free. Following is a short list of some of the books I’ve particularly enjoyed listening to. Most of these titles are probably available from Amazon in a print or ebook edition.